It always seems as if things break just when we need them most. Your air conditioner may be running perfectly all season long, and then without fail, the hottest day of the year arrives and your unit won’t turn on. 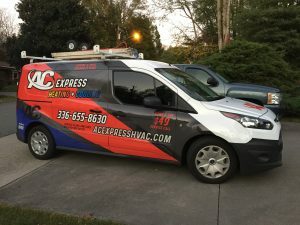 If you find yourself in this sticky situation with nowhere to turn, pick up the phone and call the HVAC experts at AC Express Heating & Cooling LLC for reliable and affordable air conditioning repair. We provide air conditioning repair services for all homeowners throughout Winston-Salem, NC and the Triad areas. When your air conditioner breaks down, you can either repair it or replace it. We can easily repair your unit and install any new part that needs to be replaced. We can also clean out your fan coils to make sure your duct work is clear of any dirt, debris, and other allergens. We provide dependable air conditioning repair to make your home comfortable! If your unit is broken beyond repair, then there’s no better place to purchase a new air conditioner than from AC Express Heating & Cooling LLC. Our air conditioner units are built strong and will keep your family and home cool and comfortable for many years to come. If you are experiencing an AC emergency, or if you just are interested in installing an air conditioner in your home, give us a call. We will then visit your home, inspect your unit, give you a fair estimate on the proposed project, and get right to work. It’s that simple. We also provide seasonal tune-ups to make sure everything is running up to par. Call today! Contact our air conditioning repair experts for service in Clemmons or Winston Salem, NC!